These 3-in-1 sachet of white coffee have become very popular over the past few years. Each sachet has enough coffee, milk, and sugar powder for one perfect cup of coffee. You can find lots of different brands now, even here in the States. But the “Ah Huat” brand is not available here. 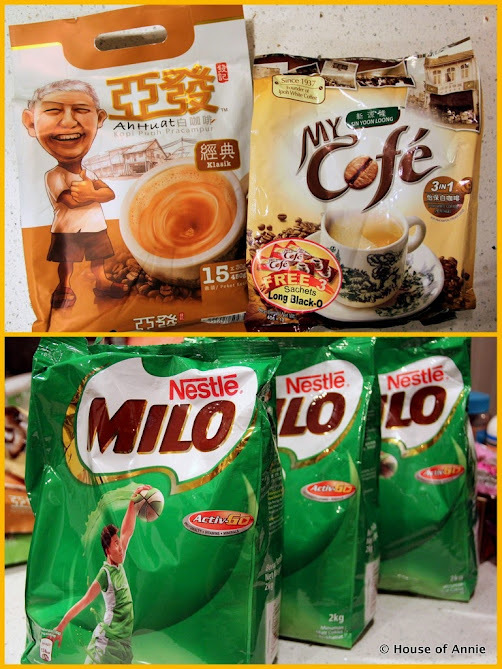 The other brand that we got, “My Cofe”, is only currently available in Ipoh, where the white coffee craze started. “Ah Huat” has a nice aroma, while “My Cafe” has more coffeee flavor. Both will help us get through our post-vacation jet lag. The kids love having a cup of Milo in the morning, so we had to buy some bulk bags of Milo since they go through it so quickly. We’ve been using the Koon Chun Thick Soy Sauce to make KL-Style Hokkien Mee, Ayam Pong Teh and other dishes calling for thick soy sauce. But this brand of black soy sauce is what we really need. The first thing we’re going to make with it? Tau Yu Bak! 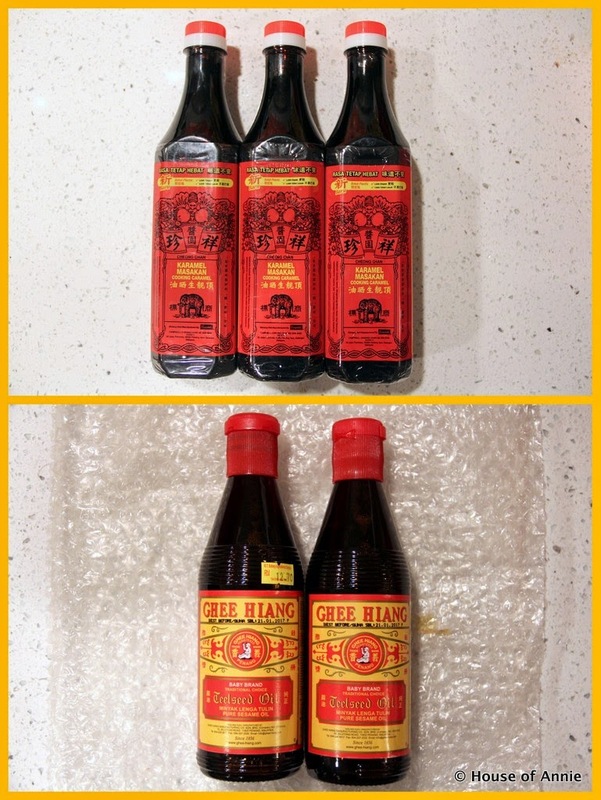 We used the Ghee Hiang Sesame Oil when we made Pan Fried Phong Pneah but we’ll use it in any dish that calls for sesame oil, such as 3 Cups Chicken or Chinese Chicken Salad. We brought some dried noodles back with us, like the hand-pulled mee sua from Sarikei, some instant kampua mee from Sibu (said to be 90% close to the real thing), and some dried Yee Mee noodles that Annie can’t find here in the States. We bought some Gula Melaka for making desserts such as Sago Gula Melaka or Bubur Cha Cha. Perhaps we’ll even attempt some cendol – that is where the gula Melaka really shines. We also bought some curry powder mixes such as the Dancing Chef brand Thai Green Curry paste. We’ll use the salted fish to make Steamed Chicken with Salted Fish, and the anchovies to make Won Ton Soup or Sambal Ikan Bilis. We didn’t find any dabai paste, though, so we won’t be making Nasi Goreng Dabai. We got to spend some time with a friend in Sarawak who taught us how to make Hainanese kaya (coconut-pandan-egg custard). This is a portion of the batch that Annie actually made. Can’t wait to blog in another post about how easy it is to make kaya at home! Too bad we didn’t bring back any Roti Bengali from Penang to go along with it. Another friend gave us a bottle of tuak – a rice wine made by the natives of Borneo. Sweeter than sake and really nice to sip on the rocks. 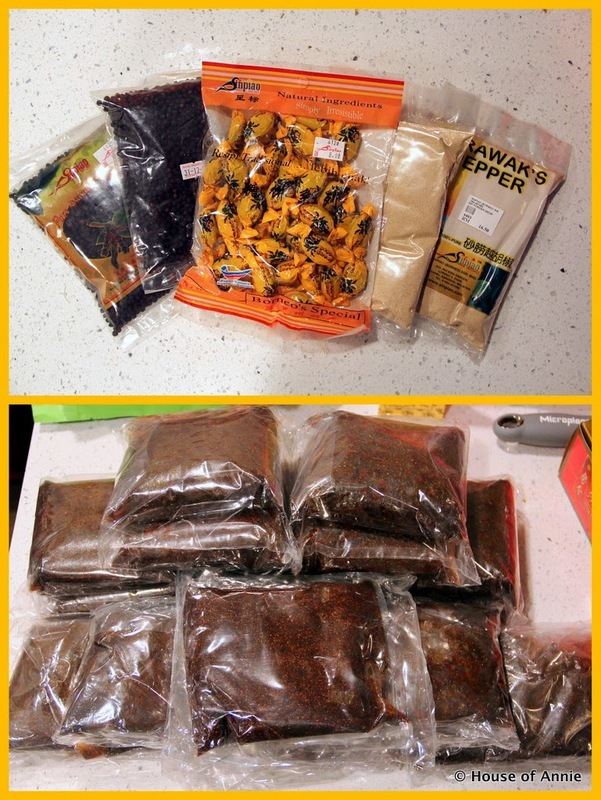 Of course, we couldn’t go to Sarawak without picking up some Sarawak pepper. The black peppercorns we’ll use in Filipino Pork Adobo while the powdered white pepper we’ll use to season Jook, among other dishes. Since we don’t know when we’ll next be in Sarawak, we had to bring home lots of Sarawak Laksa paste packets. 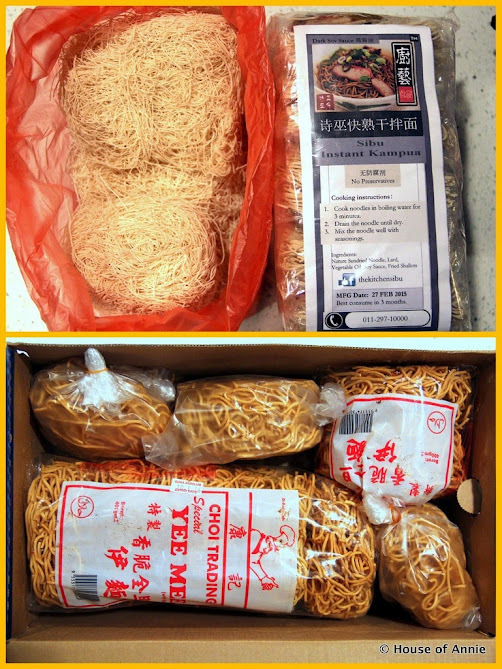 We’ve been introducing our friends to the wonders of Sarawak Laksa, so hopefully these packets will last us a good long while. Annie’s been wanting a tiffin so that she can transport hot soups around. She intends to use the metal bowls to cook “Lo Mai Kai” with, among other things. 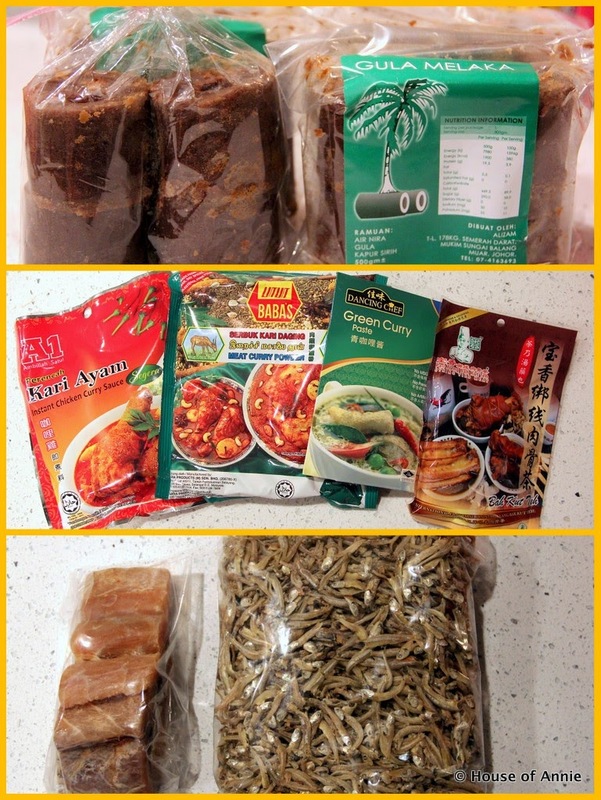 The last thing we brought back from our trip to Malaysia was not actually purchased in Malaysia. 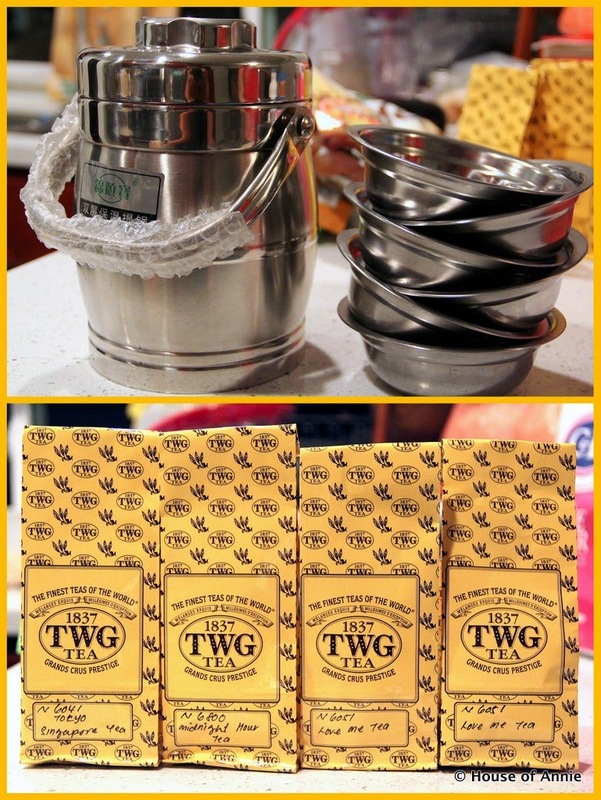 During our brief transit through Changi Airport in Singapore, we stopped at the TWG Tea shop in Terminal 2. Annie is really enamored with this tea, especially the “Love Me Tea” blend. It’s really good tea, though not cheap. So that’s our haul. Not bad, eh? What sorts of foodie things have you brought back from your travels abroad? Leave us a comment below! 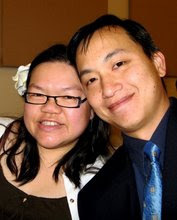 Good to know you guys are back safely! Hey, I didn’t know you could bring in such items like Milo, spices and other food stuff to the U.S.? I thought they had very strict laws on importing food stuff into the U.S.? You can bring in things that are packaged. The only things they don’t allow are fresh meat and meat products and fresh produce. Fish and seafoods are okay. So now you know what you can bring us when you visit. Sure, will let you know before we visit next so you can provide us with a shopping list! Too bad I can’t bring any durians! 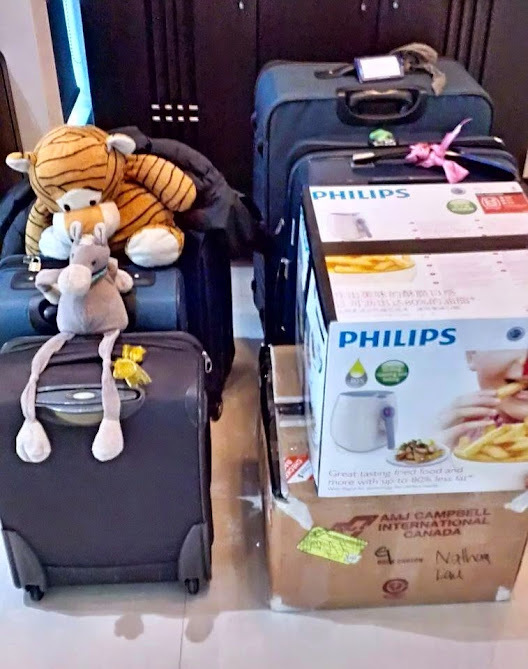 Our bags are packed with almost the same stuff except for the Sarawakian stuff! We have also brought back kualis. Its amazing all the Hawker foods I have learned to cook being here! Glad to know we are not the only “weird” ones carting all this stuff. SWIFT Theme by Satish Gandham. 58 queries in 0.682 seconds.